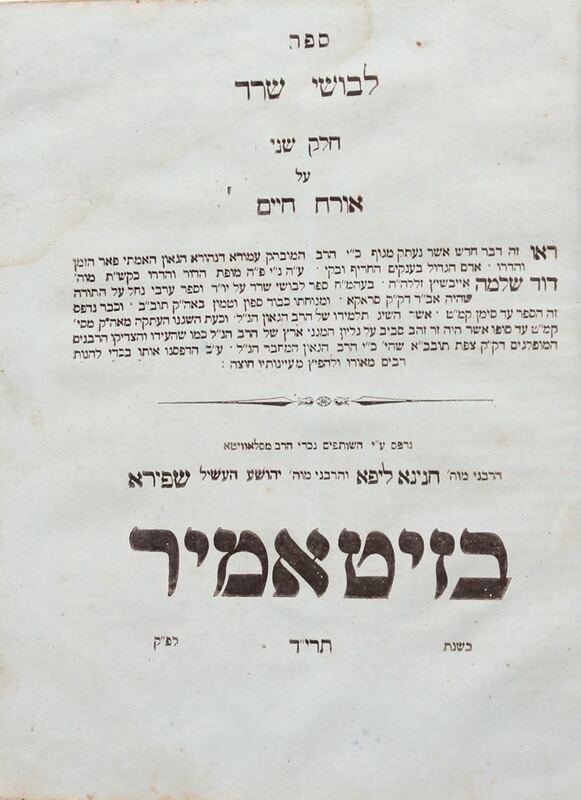 Levushei Sarad—2 sections, printed by the Shapira brothers, grandsons of the Slavita Rav. Zhitomir, 1853. On Shulchan Aruch Orech Hayyim, sections 1-2, with exegesis Binyan HaBayit, by Admor Rabbi David Shlomo Ivshitz (the Arvei Nahal). First edition of the second section. Endorsements of rabbis of Tzfat, Rabbi Shmuel Heller and Rabbi Binyamin Zeev. Cover of first section missing. Section one has 64 pages, section two has 134 154-168 pages. 22cm. Thick blue paper, stains, moth marks. Last page repaired with slight missing text. Not bound. Generally ok to good condition.